What Does a Cooker Hood Do? If you cook using your hob, you’ll inevitably cause a degree of air pollution in the process. This is because when you heat food to the point that it cooks, a portion of it will evaporate. This effect obviously becomes more apparent with some methods of cooking than with others. If you’re cooking a steak on a searing hot griddle pan, a torrent of smoke will inevitably issue forth. Clearly, if you’re to avoid having your kitchen turn into a scene from ‘Towering Inferno’, you’ll need a means of removing those airborne carbon particulates. But smoke isn’t the only pollutant that cooking on a hob might produce. When you cook with oil, you’ll release particles of grease into the air. These particles will float around your kitchen, causing a smell that will linger wherever those particles settle. And even if you’re doing something as apparently innocuous as steaming broccoli, you’ll be spreading moisture – which can cause metal to rust, wood to rot, and eventually, a kitchen to fall into general disrepair. 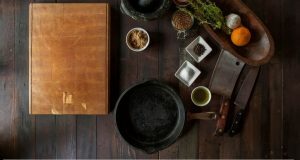 The cumulative effect of a hundred or so cooking sessions will almost certainly be damaging to property, health, and the enjoyment of your kitchen. This means we need some means of cleaning the air while we cook. Fortunately we have such a means – the cooker hood. How Do Cooker Hoods Work? Cooker hoods generally come in one of two different varieties. Let’s examine them. Extraction hoods will remove those unwanted gases to the outside of the kitchen. To do this, they require a suitable hole in the wall and some ducting through which air can flow. Extraction hoods will not necessarily cause a great deal of heat to be lost, but they’re heaps easier to maintain than other designs, as they only have a single set of filters (more on that shortly). Instead of channelling air outside, recirculating cooker hoods will clean it before returning it to the kitchen. They’re far more heat-efficient than their extraction counterparts, but they do require a little more maintenance. Recirculating hoods filter out smoke particles, which are a few microns wide. Unfortunately they have no means to remove water molecules, which are many thousands of times smaller than that. 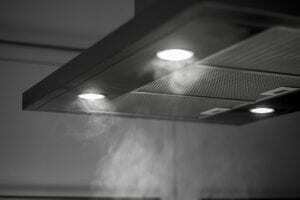 Consequently, recirculating cooker hoods cannot remove steam from your kitchen. Both varieties of hood require a means of removing grease from the air. This comes in the form of a grease filter – a grille which sits across the interior of the hood, upon which grease particles can collect as they travel upwards. You might suspect that an extraction hood would not require such a thing – after all, grease is being ejected into the outside world, never to be seen again, isn’t it? Well, no. Were it not for the filter, grease would accumulate further up the ducting, slowly creating a fire hazard. Through the filter, grease accumulates only at a single point, and can therefore be removed easily and safely with a quick clean. Unfortunately, few people actually do this – be one of those few, and you’ll ensure your hood stays safe and efficient. Recirculating hoods must be fitted with carbon filters, whose role it is to remove smoke from the air before it is recirculated. These filters are designed to be removed and replaced rather than cleaned – do this every few months in order to maintain airflow. Buy a cooker hood today from Ship It Appliances and get free & fast delivery! Discounted prices, expert advice and superb service. Wide range of styles & sizes available. Show Me The Cooker Hoods! Why does fan speed matter? The fan speed is usually adjustable via a selector on the front of the hood. The higher the speed, the more quickly the hood will be able to remove air from the kitchen. If your cooking is putting out more smoke than your extractor can cope with, then you’ll start to see the room slowly (or perhaps, not so slowly) fill with smoke. When choosing a cooker hood, it’s important to consider not just the hood’s extraction rate – the size of your kitchen matters too. In short, the bigger your kitchen the more powerful your extractor fan needs to be in order to work effectively. You also need to consider the length and diameter of the ducting run and the number of times it bends. The longer and narrower the ducting run, and the more bends it has, the more powerful the fan needs to be. To calculate the extraction rate required to ensure your fan operates effectively, you simply multiply the volume of your kitchen by ten. This means a cooker hood with an extraction rate of 600 m3/h should be sufficient for the room. Inhaling smoke and grease every day for years on end is unlikely to be good for you. This is a bigger concern if you’re fond of cooking on a high heat, or have a tendency to burn your food. Smoke is the most obvious airborne contaminant that results from cooking, but airborne grease and steam can also cause problems, as it eventually settles onto walls and over time, can result in considerable damage. You might imagine that these problems can be guarded against simply by opening a nearby window, but there are several reasons this might not be so advisable. Hot air is famous for rising – it is not quite so famous for proceeding immediately sideways in the direction of the window you’ve just opened. This means that all of that unwanted smoke, steam and airborne grease will simply spread out across the room and much of it will condense before it even reaches the window. Moreover, since an open window does not come equipped with a fan, it has no means with which to draw those unwanted air particles outside – you’ll be relying on the direction and speed of the wind to coincide with your cooking habits. An open window is also grossly heat-inefficient. On those frosty winter mornings, an open window will allow an enormous amount of cold air into the kitchen. If you’re looking to open a window in order to offset the property damage caused by airborne grease, then you’ll likely be disappointed. Are Cooker Hoods Required By Law? As we’ve seen, cooker hoods play an important role in keeping a home safe and pleasant to inhabit. Part F of the Building Regulations requires that a building has a means of ventilating itself. 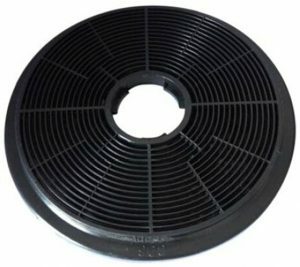 Extraction hoods satisfy this requirement; recirculating ones do not. This means that if you opt for the latter, your home will need to have some other means of removing air to the outside. Fortunately, most new builds have extensive and finely-balanced ventilation systems, meaning this is rarely a problem. 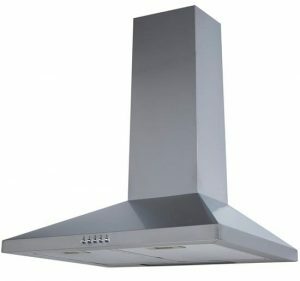 What Type of Cooker Hood Do I Need?